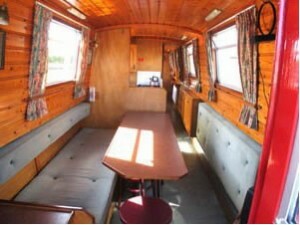 Buying a canal boat or narrowboat. Why buy a canal boat? Which type of canal boat? Which type of canal boat should I buy? TRAD: Ideal for live aboard, typified by a short back deck of 2-3 feet in length, with more room inside for living than on other styles. CRUISER: Ideal as a holiday boat. Back deck of between 4-8 feet long, ample space for several people. Dutch Barge style boats are becoming increasingly popular with people cruising the larger waterways, however, the available mileage of waterways inland is limited. While it is possible to buy Narrowboats and Dutch Barges from stock, most are built to order. Almost all are hand-crafted, and take many weeks to complete. Discuss your requirements in detail with your chosen builder, agreeing a delivery date and price. Be prepared to visit the builder at regular intervals during the work. You can choose the layout, colour scheme, fixtures and fittings. By specifying every detail, you can get the boat of your dreams. Be careful if designing something very ‘unique’, this can affect the resale price later on, as can work carried out by unrecognised craftsmen. A good builder with an established reputation is a good investment. The boat will be built to the standards of the EU’s Recreational Craft Directive (RCD), which sets out minimum standards for safety and quality, and is compatible with the UK’s Boat Safety Scheme. This immediately qualifies it for a waterway licence. You should check that your builder is aware of RCD regulations. If you buy from stock you will get good-value craft, although these will often be without all the refinements of a bespoke boat. Such boats are sure to stand you in good stead for many years’ boating and you can always add or change features later. Boat shows are good places to see some examples. River cruisers are usually made from ‘GRP’ fibreglass moulds, and available in standard configurations – just like a car. You could be afloat within days of buying your new boat. You will often have a choice of engine type and accessories. Many builders offer a ‘family’ of cruisers in different sizes, so you can choose one that fits your budget and your family. Sailaways and shells will generally be coated with paint primer and supports fitted for the chosen engine. Window openings, stern tube and propeller will be in place. Partly-built narrowboats can be purchased either as a Sailaway (with engine) or shell (without the engine fitted). These can then be completed by the enthusiast or by a preferred builder.. If you buy a sailaway or shell the shell builder must provide an RCD Annex 3 Certificate. While you do not need to comply with Recreational Craft Directive requirements unless you resell the boat within five years, it will require a Boat Safety Certificate. When having a boat built it’s a bit like having your own house built – you should expect to put down an initial deposit and make ‘staged’ payments as each section is complete. - a final payment when work is complete. Document and agree these payments when drawing up your contract. The British Marine Federation (BMF) form of contract is an industry standard designed to protect both customer and boat builder. It documents the stages which the purchaser has paid for and owns. We strongly recommend that you insist on this contract. In general buying second hand will give you better value in terms of features but the maintenance costs of a second hand boat are likely to be higher. Look for receipts for work done on the boat, such as service bills, hull blacking and for invoices for other expenses such as mooring fees etc. Bear in mind when buying second hand that there is usually some work to be done on it. Second hand boats are available from marinas, boatyards, brokers or individuals. In some cases the boatyard may be selling the boat themselves or they may be acting as a broker, offering it for sale on behalf of someone else. The seller, on completion of the sale, will then pay them a fee. One advantage of using a broker is that they may also be able to arrange insurance, finance, transport and surveys for you. It would be wise to seek your own surveyor for your own piece of mind. Second hand boats for sale are advertised in the monthly waterways magazines which are available from newsagents with many now also available online. Make sure the boat you are buying is owned by the person selling it! Unlike motor vehicles, boats don’t come with registration documents. Some may come with proof of ownership in the form of a “bill of sale” but many don’t, so you need to obtain proof of ownership. Do as much homework as you can. Bear this in mind too while you own the boat, keeping receipts etc to simplify the process when you come to sell it. Before making your decision, bear in mind the likely re-sale value of the boat you are considering. The more unusual it is, the more difficult it may be to resell later on. Some second hand boats may be former hire boats. Be aware that former hire boats may or may not have been well maintained. As a live aboard boat, they may well need a lot of money spent to get them properly equipped for all year round use. They may well have had a very hard life. A sound hull – well maintained engine – sound internal infrastructure without rot (suspect air freshener – what’s it hiding?) – A fairly clean engine bilge shows good maintenance – but if too clean was it steam-cleaned just for the sale. You would be well advised to have your boat surveyed before agreeing to buy. The money spent on this could help you avoid losing a small fortune as well as spoiling your dreams. Finance can be through a personal loan from a bank or building society, or marine mortgage from a specialist broker. There are several finance companies offering deals for boat buyers. It can be difficult to arrange finance secured on the boat alone so may be worth sticking to an organisation you already have a reputation with – as long as it is good! Things to Consider When Buying a Canal Boat. This depends on the number of people who will be using the boat and for how long. For a holiday 30 – 40 feet is ample while 50 feet plus is better for extended cruising or live aboard. 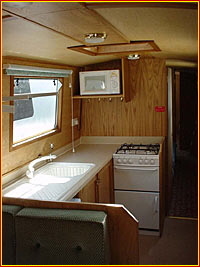 Size will also affect the number of berths (beds) and therefore the number who can sleep comfortably on the boat. Boats can exceed 90 feet in length, so be aware of the maximum boat size that can be accommodated by the locks on the waters you wish to cruise. Larger boats will require more skill to manoevre them through the tight spaces you will encounter. Figures quoted such as 10/6/4 relate to the thickness of steel used for the various parts of the boat. For example 10/6/4 relates to a 10mm bottom plate, 6mm hull side and 4mm cabin side. While standard specification is 10/6/4, steel thickness of 8/6/4mm and 6/5/3mm should not be ruled out if you are prepared to maintain them appropriately. Older boats will often have wood and GRP (glass reinforced plastic) mainly for the cabin. These are not as desirable as all steel, but provide a cheaper option. Water-cooled diesel engines and the older, slightly louder air cooled diesel engine both offer ease of use and reliability. The Vintage engine will suit larger boats (40ft +) and will appeal to those who like to ‘tinker’ with such items. Pump out toilets – considered more hygienic, but a cost is involved of around £10 – £15 for emptying. The chemical or Porta Potti – is free to empty. The type of heating you have is down to personal preference. Many people prefer the solid fuel stove’s authenticity and dry heat, but on the negative side is the time spent preparing the fire, whereas gas and diesel provide almost instant heat, along with the drawback of condensation. Hot water will normally be provided either from a heating unit or central heating system. A second option is to form a Calorifier using the excess hot water from the engine cooling system or central heating boiler. Nearly all boats will have a 12 Volt system installed. A 240 Volt system can be set up by:. a) Landline: A connection to plug in at a marina, when an electric supply is provided. b) Inverter: This is a devise that converts your 12 Volt battery supply to a 240 Volt supply for domestic use, an average price will be in the region of £100 to £1,000, dependant on size. c) Generator: Either a petrol, gas or diesel generator will give you a 240 Volt supply. Prices vary considerably. With such an important purchase as a narrowboat it is recommendable to get an independent qualified surveyor to inspect your potential vessel. The cost varies, however expect to pay around £300-350 for the surveyor and £150 for taking the boat out of the water to inspect it. 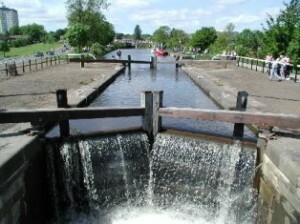 An official list of surveyors is available from British Waterways. Your boat will have to withstand some severe stresses on the hull if it is to be moved across land. Not all journeys are better, some not even possible, by waterways. Watch our videos for examples of boats being lifted or towed out of the water to see what can happen. NB: A surveyor will not automatically carry out a Boat Safety Scheme examination as part of the survey unless this is specifically requested. These are generally the same item, but the BWSC is the updated version of the C of C.
The BWSC is similar to an MOT for a boat, covering the safety aspects like gas and electrical installations, but not the condition of the hull or engine. This certificate lasts for 4 years and costs in the region of £100-£130. Every boat needs to have a valid certificate. If the boat fails then you have 6 months to rectify any problems. This documentation that should be issued with new boats put on the market after June 1998. - marks the product with a CE Marking. Repainting: about £80 per foot (inc VAT) for traditional painting of complete cabin to guard iron. Don’t be afraid to ask for a free quote. Total: About £3,500 upwards per year for a 50ft boat. In order to spread the cost, one option would be to share ownership in a boat. A typical arrangement is where a group of people (normally 12 or so) each have a share or shares in the vessel, which is maintained by a separate company. In this way it would be possible for each party with a share to spend up to 4 weeks of the year afloat for not much over £300pa, on the costs laid out above. Much cheaper than hiring. £70 (off season) – £200 (peak season) per day, £450 – £1,200 per week, depending on location, size, age etc. As with any purchase, the more research you do, the more likely you are to make the right decision. Read up through specialist magazines, check out our useful links page for details of websites for builders and brokers, visit exhibitions and spend some time on the sort of boat you’re thinking of, even if only for a weekend.